Home » Bathroom Help Category -- Also note those subcategories in the orange navigation, above! 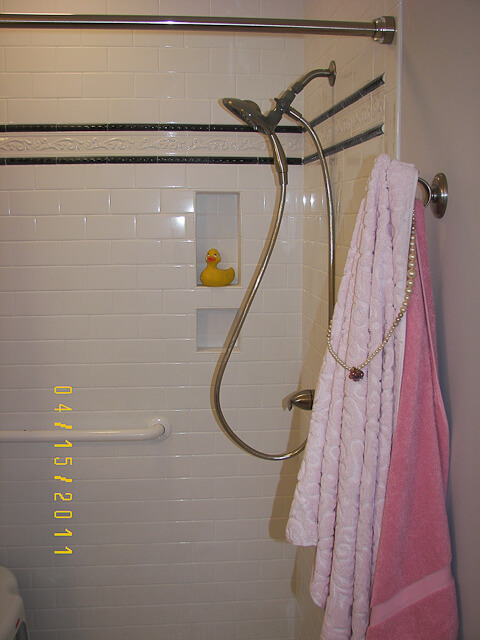 » readers and their bathrooms » Mom’s black-and-white vintage bathroom sparkling with vintage jewelry: Done! 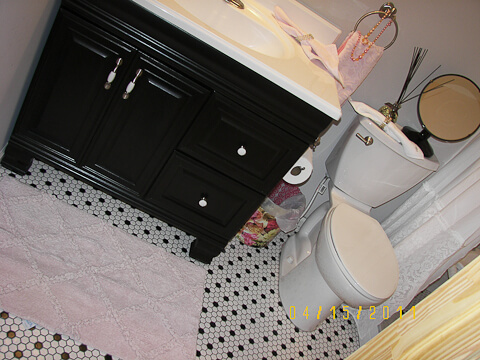 Mom’s black-and-white vintage bathroom sparkling with vintage jewelry: Done! 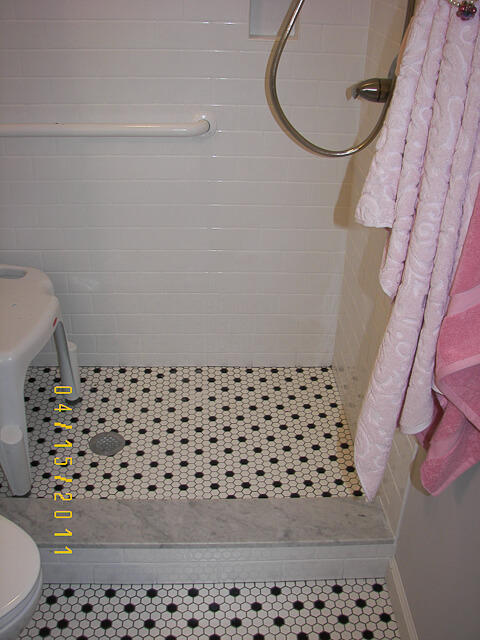 The crash project to create a vintage style black-and-white bathroom is: Done! And oh my gosh, did we have fun. One of the highlights, for sure, was at the very end, when Aunt Mary Anne and I were decorating. I remembered that I had just seen a bag of vintage costume jewelry in another bedroom, which Mom had picked up at an estate sale. 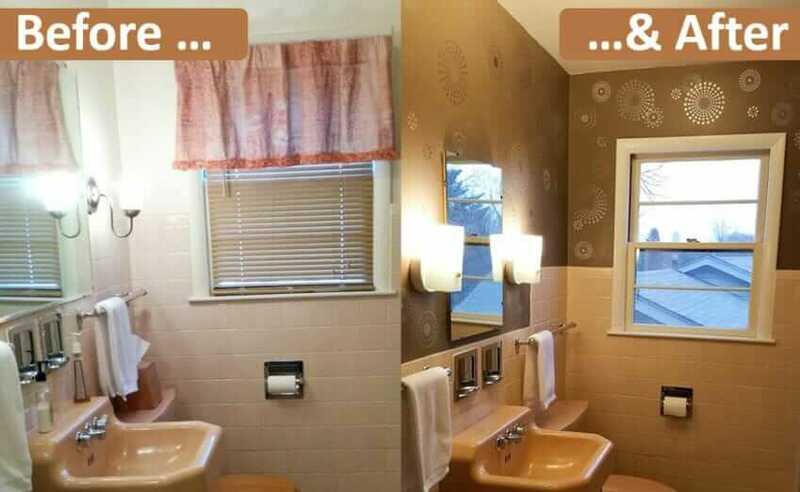 We used it to bling-ify the bathroom, giving it a sparkly girly-girl lift. 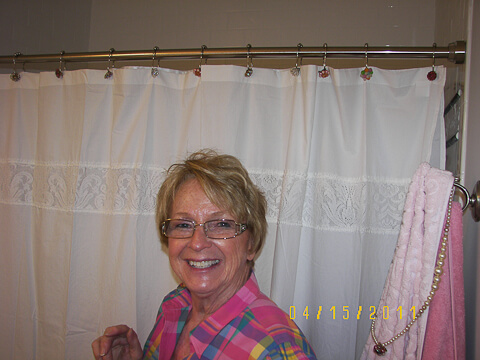 Aunt Mary Anne thought to put the vintage earrings right onto the shower hooks. 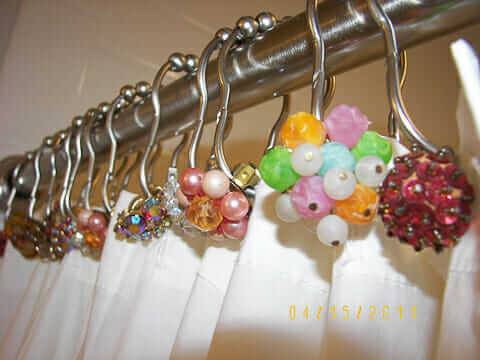 We created: Shower Curtain Rod Ring Bedazzlers! LOVE! Aunt Mary Anne rocks! She is the the most AMAZING decorator in the world. I learned SO MUCH from her. Note the shower curtain. It — and the pink sculpted towels — are both from the Target Shabby Chic collection. As part of my “get this bathroom done in 7 days” constraints, Target and one nearby antique mall are the only places I shopped for decor. I went right for those sculpted Shabby Chic towels. She also guided me to buy the deeper pink towel (“Home” collection, I recall) and to layer them. She then draped a costume pearl necklace over — clipping the earring at the bottom. 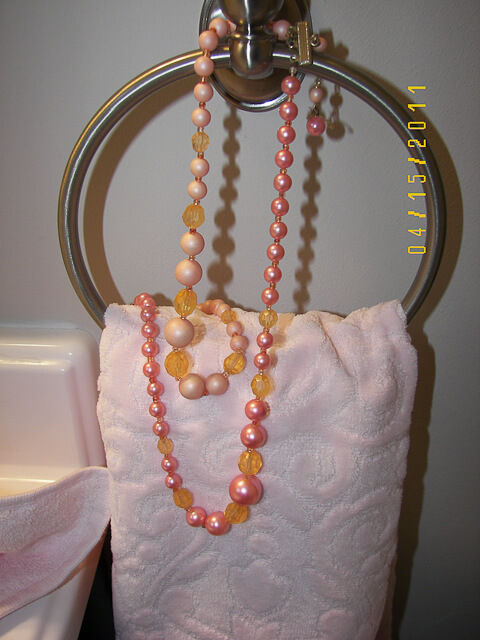 Target Shabby Chic sculpted pink hand towel with costume jewelry. Aunt Mary Anne sees this photo and says, “What happened to the earring?” At left: A peek at the $98 white vanity countertop from Lowes. Cultured marble = plastic, but I like it! We initially thought that we would use a sliding shower door. I actually have it, and am stuck with it — Lowe’s will not take it back because it was a “special order” (even though it was very simple and was in a stockroom waiting somewhere. This annoys me to no end. Shame on you, Lowes, you lose mega points off your otherwise near-perfect score for overall wonderfulness for this ridiculousness.) We changed our mind to go with a shower curtain, rather than a sliding glass door, to give my mom more space to maneuver in the relatively narrow shower area. 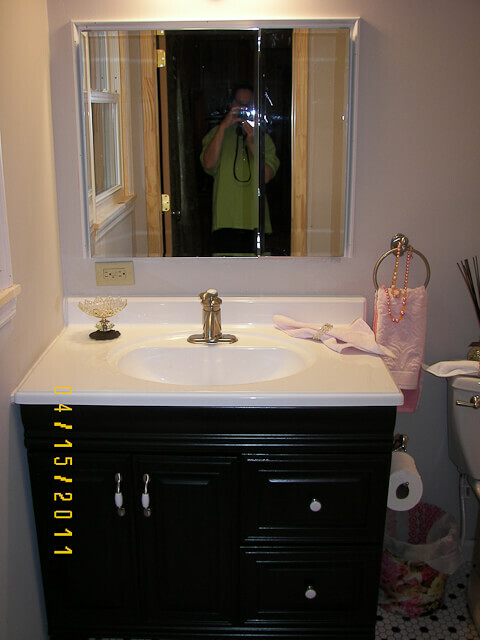 Above: The Lowe’s vanity that I painted black using Rustoleum Cabinet Transformations — the whole project turned out great. I want to paint everything using the Rustoleum kit process! New pulls and knobs from Home Depot. Kohler Fairfax lav faucet from FaucetDirect.com. Soap dish: Vintage, from a rapid-fire shopping trip to Peddlar’s Mall in Elizabethtown, Kentucky. Wastebasket: Old popcorn tin that Mom had saved. Aunt Mary Anne is mortified that we did not have “real” wastebasket liners, available from Bed Bath & Beyond, and that we had to use an old Target bag instead. She is a totally convincing role model about “do it right.” Vintage bracelet around the hand towel. Paint colors: Regular Gray (wall) and Alabaster (trim), both from Sherwin Williams. The gray has a bit of pink in it – when the sun comes through in late afternoon, it even looks a bit lavendar. Jeremy laid the tile. 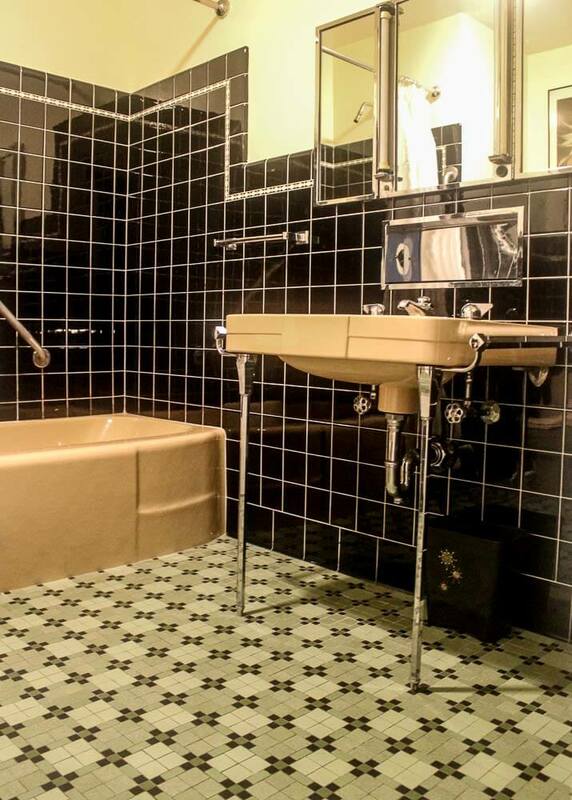 The grout is Delorean Gray, from Tec — a wonderful grout color. The threshold of the shower is Carrera marble. Yum yum yum. 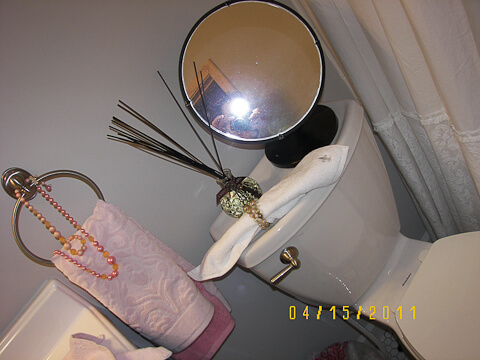 We even styled the top of the toilet. I found the big, heavy round vintage shaving mirror at Peddlar’s. Mary Anne and I are both super detail-oriented. She totally approved of the fact that I replaced the stock toilet flushing lever with a satin-nickel one from Moen. 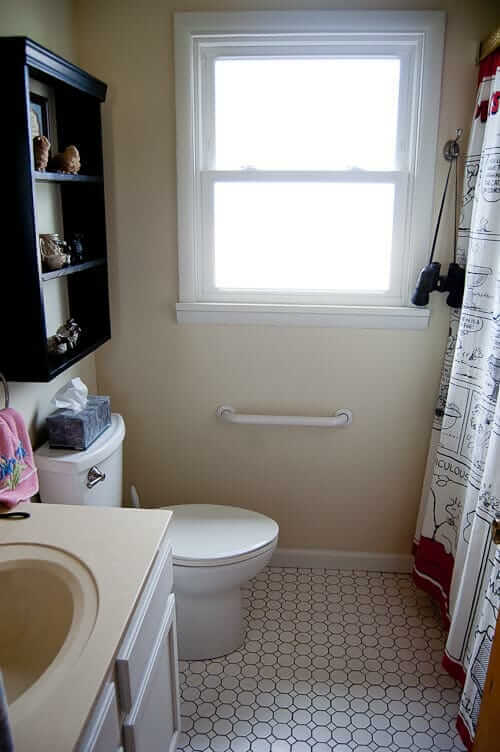 Toilet is American Standard, comfort height — the complete kits from Lowe’s. We actually replaced the toilet in the hall bath, too. However, they IMMEDIATELY started exhibiting problems. BOTH of them. IMMEDIATELY. They run after you flush and you have to jiggle the handle to get the tank to fill. This is also Ridiculous and will have to be remedied. Shame on you, American Standard and Lowe’s, for selling piece- of-crap crappers. …i don’t see those sculpted towels at the Target website? I am not sure what Target shows on their website vs. what they have in the store….Note, the towels are “Shabby Chic” for Target, as I recall. Looks wonderful! Pulling out the bath and making the area into a shower is what I’d like to do with my downstairs bathroom. 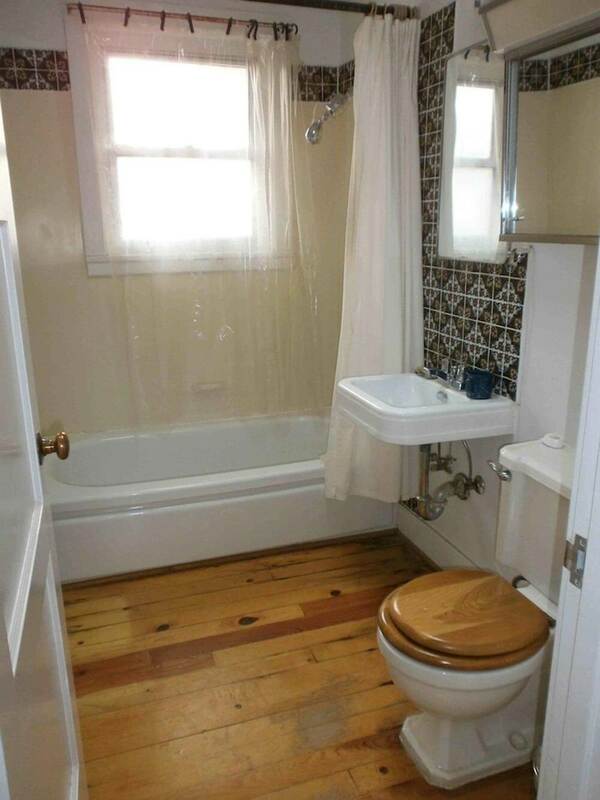 I’d rather do it upstairs, where I take more showers, but that bathroom has the lovely original ’62 yellow bathtub. Black and white is so great for a bath, you can totally change its look and feel with new paint or accessories. Question on the curtain vs. shower door. Is your mom noticing any water splashing out of the shower because there is a curtain instead of a door? We have a much smaller space to work with and I really would rather not have a door (I hate cleaning them because I never feel like I can get them clean enough). Just wanted to see if she is liking it and it’s staying dry outside of the shower. So far so good, Mom reports, in terms of the curtain containing the water. There is a liner, as well — and we’re also “upgrading” to get a liner with edges that have some sort of sticky-ify thingie on the edges, too. My view: Give the curtain a try; use a tension rod. Nothing lost (no holes drilled, no big investment) if you decide to go witih the shower door later. What an adorable renovation! I am currently having a bla 70’s bath redone with a clawfoot tub! Everything will be very girly, hubby has his own bath 😉 I had ‘crystal’ knob type curtain hooks in mind UNTIL I saw your shower curtain bling. LOVE IT! !